I headed west to Winston late in the Morning with Solid Verbal (and later The Old College Try) riding shotgun. My first stop was the Publix in Winston, which has been there for about six months. Buffalo chicken fingers Pub sub and a six pack of Blowing Rock Brewing's High Country Ale. 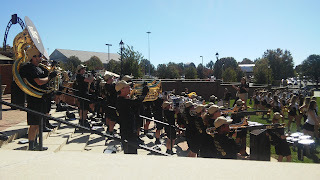 I got to the stadium about 2 1/2 hours before game time and could already hear the Spirit of the Old Gold and Black's horns and drums at work for the Deacon Walk. If you're familiar with the layout of BB&T Field and its environs, most of the common parking is by the LJVM Coliseum, Wake's basketball arena, and you cross through a tunnel to get to the stadium. 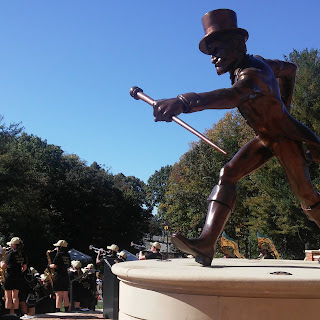 I could hear SOTOGAB loud and clear upon parking, and headed immediately over to catch what remained of Deacon Walk and the concert by the Deacon statue. I really try not to be condescending when discussing Wake's size, but some things can't be denied or ignored. Wake Forest is the smallest school by enrollment in the Power Five conferences, and their stadium, in kind, is the smallest in the Power Five. The atmosphere, while lively, is probably on par with many in the Group of Five or high level FCS programs. And while I do genuinely enjoy what SOTOGAB has to offer, I like big bands and I cannot lie. While I could've, I didn't directly count membership, but I'd say they're 60 members soaking wet at best. While I know I've seen them march more - and play more in their pep band, in fact - they had just two sousaphones, which is one of my key shorthands for band size. Still, they packed a decent punch even from the game, where I was across the field and still about 80 yards from them. After their concert, I headed back to the car for a bit more of my sandwich (I scarfed half and rushed through a beer upon my arrival) and realized that while my plan was not to tailgate, even having thrown a chair in the back of the van would've probably been a better look than standing awkwardly by the side of the car, though I ultimately decided to take it over to the memorial pillars in front of the Coliseum. I enjoyed some of the area's other offerings at a leisurely pace: The school-sanctioned tailgate area, a beautiful fall day on North Carolina's Piedmont, and eventually SOTOGAB warmups and the march to the stadium. I headed in as they did. As coincidence would have it, i was in section 9, meaning the last time I walked through that tunnel was the rainout of NightBEAT back in July. 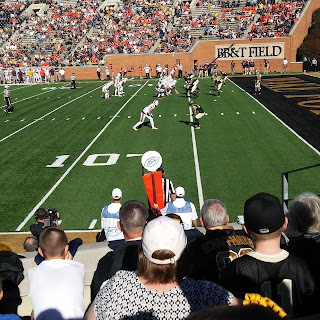 The weather was far more on my side last Saturday, and my seat wasn't too bad either: Home side, side 2 6 yard line, about 5 rows from the action. I picked it up on the secondary market, though admittedly, I waited a bit longer than I should ave, price-wise. The game was a good one between two middling ACC programs. I rooted for the home team, and was pleased to see them win and gain bowl eligibility. The crowd immediately surrounding me was energetic, if not pessimistic, and they certainly felt a bit of inevitability when #accrefs struck. Virginia had a running back who was capable of taking advantage quite a bit both from handoffs and as a receiver, and Wake had some of the most lethargic QB/RB exchanges I've ever seen, but they were able to generate enough offense - helped by the defense, including a couple of key late takeaways. Wake scored the go-ahead touchdown deep in the 4th and was able to hold on for the victory. Spending a fall day at a random act of football, the way nature intended, had me considering again if I want to consider a partial pass to Wake Forest football. While there's no actual allegiance, if you can't be with the one you love, love the one you're with. I know next season will include a USF game on my turf (we play at ECU in odd years) and likely some action up in Boone, as a friend's son will be playing at App State. Still, Wake will always be an option for delightful filler.